E00718. 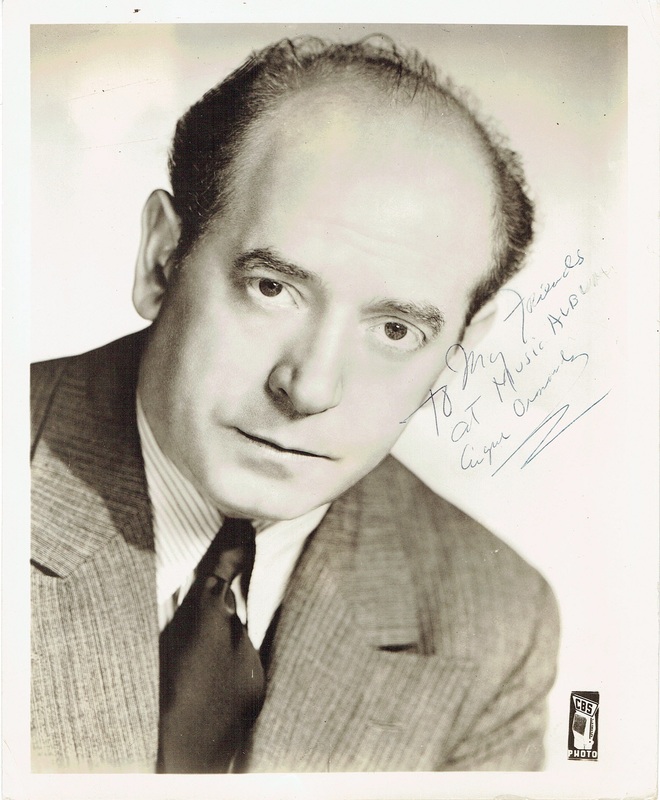 Ormandy, Eugene - signed CBS 8x10 Photo signed and inscribed “To my friends at Music Album” sepia photo. “Longtime Philadelphia Orchestra conductor Eugene Ormandy (born Jenó Blau) developed what came to be known as the ‘Philadelphia Sound’. (He groused that it should be called the ‘Ormandy Sound’, even though its fundamentals had already been established during Leopold Stokowski's long tenure with the Philadelphia Orchestra.) Largely as an effort to overcome the dry acoustics of the orchestra's home, the Academy of Music, Ormandy emphasized lush string sonorities and, often, legato phrasing and rounded tone. He was lauded even by his own musicians for his ability to conduct everything from memory, even complex contemporary scores. Still, aside from the voluptuous tone, Ormandy's interpretations rarely bore an individual stamp. They were, however, highly polished, intelligently balanced, and well paced, always serving the scores honorably, and often with a dash of controlled excitement. Ormandy initially studied violin with his father, and entered Budapest's Royal Academy of Music at age 5, falling under the tutelage of Jenö Hubay at 9. He received a teacher's certificate at 17, and served as concertmaster of the Blüthner Orchestra in Germany, also giving recitals and performing as a concerto soloist. He moved to the United States in 1921 (taking citizenship in 1927), lured by the promise of a lucrative concert tour. 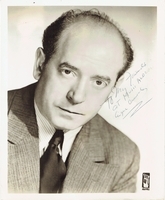 That tour fell through, though, and Ormandy was forced to make ends meet by taking a back-desk job with the Capitol Theater Orchestra in New York City, accompanying silent films. Ormandy soon advanced to the position of concertmaster, and made his conducting début there in September 1924 when the regular conductor fell ill. By 1926 he was named the orchestra's associate music director, and made extra money conducting light classics on the radio. Important débuts soon followed: he conducted the New York Philharmonic at Lewisohn Stadium in 1929, and the following year became guest conductor of the Robin Hood Dell Orchestra in Philadelphia. On 30 October, 1931, came his first performance with the Philadelphia Orchestra. The following year he was engaged as music director of the Minneapolis Symphony, with which he made several recordings, but he didn't remain long in the Midwest. In 1936 the Philadelphia Orchestra called him back as associate conductor, to share baton duties with Leopold Stokowski, who was being eased out. Ormandy became the orchestra's music director in the autumn of 1938, and held that position for 42 years, until his retirement at the end of the 1979-1980 season (whereupon he was named Conductor Laureate). He led the Philadelphia Orchestra on several national and international tours, including, in 1973, the first appearance of an American symphony orchestra in the People's Republic of China. Ormandy was knighted in 1976 -- Queen Elizabeth II's way of observing the American bicentennial.